One of the most exciting parts of being a landscape photographer is the anticipation of what a new day holds in store. Checking out all the weather forecasts and models trying to take a stab at whether sunrise is going to be a stunner works out only part of the time. More often than not, expectations are going to fall short. Clouds dissipate right at sunrise or clouds form just before sunrise blocking out first light. So many times the margin between capturing a portfolio worthy image and nothing is minute. Regardless, I always have a little more pep in my step when the possibility of capturing something worthwhile seems more likely. Yesterday forecasts and models look like this morning may have a decent chance for some nice color at sunrise. High clouds streaming in from the south and west should have been hanging out over Rocky near sunrise. I was out early this morning as I always am checking out the conditions. High clouds hung over the continental divide this morning and it was cloudless over the eastern plains of Colorado. In a nutshell this is one of my favorite setups for dramatic color over the mountains if all holds. After walking my dog Jackson, it was into the truck and up to Rocky Mountain National Park. Arriving in the park and checking out the setup things still looked pretty good. Some of the cloud cover had thinned from when I left but there was a good amount of high clouds floating around and nothing to the east to obscure first light. We are now into spring and the sun is marching northwards each day. Some of the best photographic locations in Rocky and Bear Lake Road in particular are best when the sun moves northward in the sky towards the summer solstice. 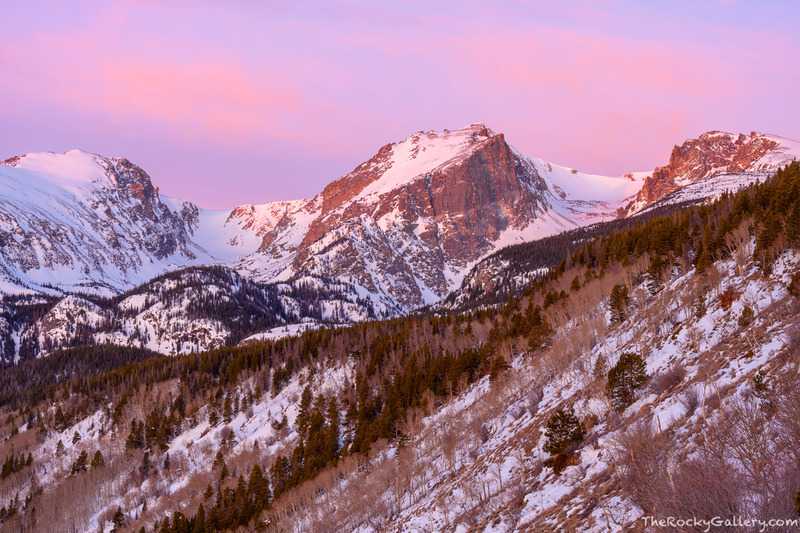 I settled on a hike up the Bierstadt Moraine for sunrise. Hallett Peak’s blocky tomahawk shaped peak has always been one of my favorite peaks to photograph and the lights getting good on Hallett, Otis and Flattop now. High up on the Bierstadt Moraine I settles on this composition. I prefer the upper portion of the Bierstadt Moraine to the lower part as more of Hallett Peak is visible above the top of ridgeline the moraine forms. Watching and waiting for sunrise on a beautiful March morning in RMNP, the pastels and pinks started popping 15 minutes before sunrise with a little more color as the sun illuminated the mountains. Everything worked out like I had hoped it would. Many times this is not the case but this March morning the madness was perfect. Posted in Colorado, Rocky Mountain National Park on March 21, 2019 by Tom Mangan. If you have been watching the national news of late, you’ve probably seen videos of all the snow, avalanches and other weather we’ve been having here in Colorado. 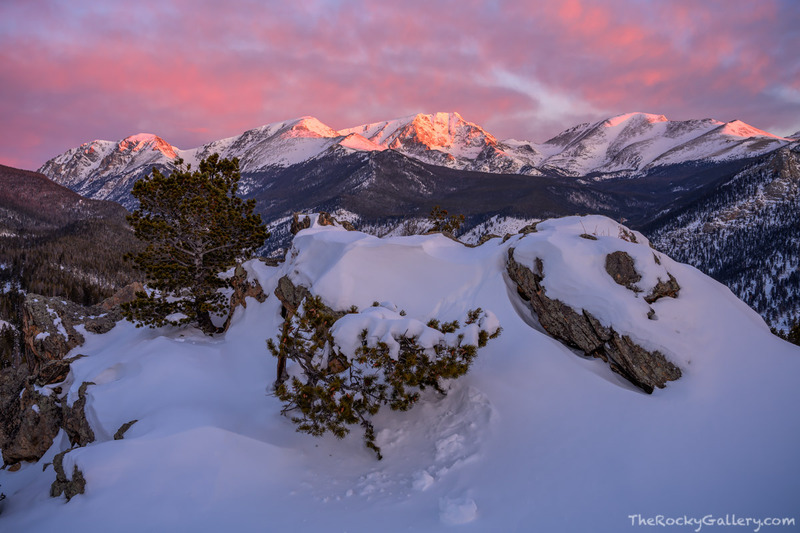 While the news stations tend to embellish situations a bit, this winter has been a very active one both for the entire state of Colorado as well as Rocky Mountain National Park. Just last week Rocky Mountain National Park and the Front Range of Colorado were hit by a very strong late winter storm that dumped lots more snow on the peaks while also being aided with extremely strong winds as well as the lowest recorded measurement of SLP in Colorado at 970.4 MB’s. Rocky did not get the hurricane like winds that many experienced in the Denver metro area but they did get the snow with very strong winds with well over a foot of new snow falling on an above already above average snowpack. This latest storm pushed the Colorado River basin snowpack on the west side of Rocky Mountain National Park up over 140% while the South Platte drainage on the east side of Rocky Mountain National Park currently stands at 136% of normal. What does this all mean for current and future conditions for photography in Rocky?. For one thing it means I certainly expect there to be lots of snow still hanging around early into the summer season. Higher elevations of Rocky are going to see lakes taking longer to thaw and trails still partially covered with snow into at least mid June and possibly even early July. Streams and waterfalls will be flowing hard as the snowmelt begins to take hold later this spring. I would expect lots of green as temperatures warm as well as wildflowers. In fact, I’m keeping my fingers crossed that we have a great wildflower season in Rocky starting in the lower elevations in June and moving to the higher elevations of the park in July and early August as I hope we reap the benefits of all the snow that has fallen in Rocky Mountain National Park and the mountains of Colorado this season. As for the current conditions in Rocky expect to see lots of snow, mostly frozen bodies of water including streams and lakes and trails still packed with snow requiring traction, skis or snowshoes. It’s still March so expect lots more snow to fall in the next thirty days but one can also expect the snow to melt quickly as both the sun and temperatures continue to increase quickly as we move towards summer. So to summarize what one should expect the next few weeks in Rocky, lots more of the same. Posted in Colorado, Photography, Rocky Mountain National Park on March 19, 2019 by Tom Mangan.